Eduane Danilo dos Santos, in the amfAR auction in Cannes. Screenshot/YouTube. 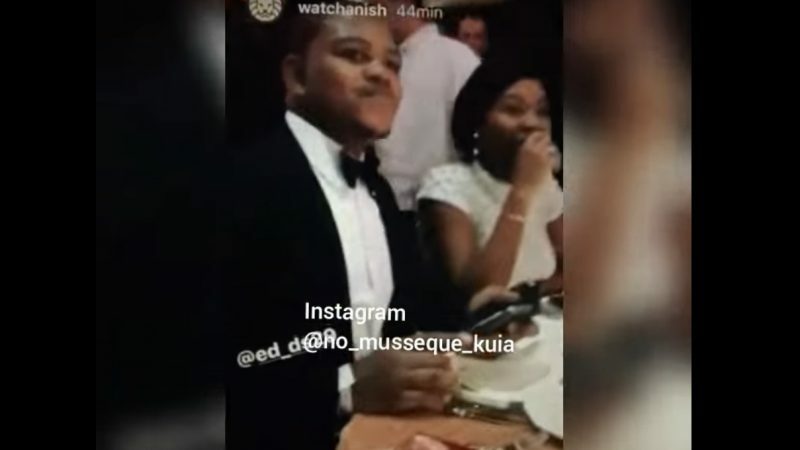 A video circulating on social media showing one of the Angolan president’s youngest sons spending 500,000 euros (about US $560,000) at an auction in France has sparked criticism in Angola. Eduane Danilo dos Santos, 25, is son of José Eduardo dos Santos, who will mark 38 years as president come September. The video captured the moment when Danilo bought an item — at first speculated to be a watch, but then later confirmed to be a set of photographs — for half a million euros at an auction organized by amfAR, an organization combating AIDS, held on 25 May in Cannes. amfAR holds the auction annually and it is known for being attended by Hollywood celebrities. In the recording, American actor Will Smith, who seems to be acting as auctioneer, remarked, while complimenting Danilo and his companion on the stage: “They look way too young to have 500,000 euros”. The vídeo was shared  originally on Instagram stories by the luxury watch blogger Anish Bhatt, whose account  boasts 1.7 million followers. Before disappearing from the site, the video was recorded and published on YouTube and soon went viral, provoking a lot of indignation among Angolans. The luxurious lifestyle of the Dos Santos family is frequently an object of scrutiny for the international press – and of anger on Angolan social media. The second biggest oil producer in Africa, Angola remains among the world’s 40 countries  with the worst human development indices. A third of the population lives  on less than 2 dollars per day. Meanwhile, the fortune of José Eduardo dos Santos has been estimated  at US $20 billion, which would put him among the world’s 50 richest  people. There are rumours about the current state of his health – JES, as he is nicknamed, recently spent 28 days in Spain  for medical treatment and everything indicates he will leave  the presidency in August 2017. For the first time since 1992, when general elections were established in Angola, his name will not be on the list of candidates of his party, MPLA – this time, the list is headed by current Defence Minister João Lourenço, his probable successor. But José Eduardo dos Santos has not spared any effort in ensuring that his legacy continues through his family. The most famous of his children is businesswoman Isabel Dos Santos, 44, the only female billionaire in Africa. As well as being president of the Administrative Council of the state oil company Sonangol, she has investments in various multinationals, from banks to telecommunications, totalling a fortune of US $3 billion, according to Forbes  magazine. For his part, Eduane Danilo dos Santos oversaw the privatization of Angola Telecom, apparently his only job so far. After receiving criticism on social media for his auction purchase, Danilo, as he is known, decided to write on his personal Facebook page. He said that the story was nothing more than a misunderstanding and that the 500,000 euros were related to the purchase of art works for his foundation “Child’s Spirit’ — an entity that turns up no traces online, except for his own mention at the auction. […] I would like to inform you that I participated in a charity auction, not to acquire a watch, but a collection of paintings by George Hurrell, representing my association “Child’s Spirit”. I have a strong conviction that I must be involved in this cause, and believe that there is a cure for HIV/AIDS, and we must continue to search for this treatment. The monetary value of this donation of €500,000 will show itself as continuing to move us in a united way, to combat this evil that affects society in Angola, and the world in general, in a difficult way nowadays. We made the purchase ‘together’ of the pieces of art as a donation of 500,000 and intend to offer these pieces of art (10 in total), for use as part of exhibitions in museums in Angola (4 in total) and the others (6) for an event at the beginning of July to raise funds. First, a correction for Danilo: it was not a collection of paintings that he bought, but actually a collection of photographs. Hurrell was not a painter, he was a photographer. Watches, paintings, or photographs… Nothing changes. It just underlines the flippancy of the act. Instead of 500,000 dollars, Danilo spent even more money: 500,000 euros, that is, around 560,000 dollars. Instead of a luxury watch, he bought a collection of luxury photographs by George Hurrell. Many of his original photographs are for sale on e-Bay for around 100/200 dollars each. Giving the photographs to his foundation is an empty gesture. What does the foundation want those photographs for? Either luxury watches or Hollywood photographs for 500,000 euros are synonymous with a total lack of judgement. The question for us, Danilo, is not what you bought, but what money you used, if it was yours you will have to settle the accounts with the courts, showing how and why you earned this money, given that you are only 23 years old [sic], being the son of who you are, we suspect that this money came out of the state coffers, that is to say it is our money, so we ask that you prove to us the contrary.